The Good Times Blog: Congratulations Duggar Family! As many of you know...I LOVE the Duggar Family! If you don't know what I'm talking about, just watch any of the Discovery Channel Channels and sometimes TLC and you will meet a family like no other. A family with 16 children...well, until Wednesday when the Duggar family welcomed their 17th child, a daughter named Jennifer Danielle! Jennifer was welcomed into the world by her siblings, Joshua, 19; John David, 17; Janna, 17; Jill, 16; Jessa, 14; Jinger, 13; Joseph, 12; Josiah, 11; Joy-Anna, 9; Jedidiah, 8; Jeremiah, 8; Jason 7; James 6; Justin, 4; Jackson, 3; and Johannah, almost 2. If you have never caught one of the Duggar's many TV specials, I highly recommend them. They are usually chocked full of tasty recipes and wholesome family fun. Congratulations to the Duggar family! I didn't even know they were expecting! Yay! 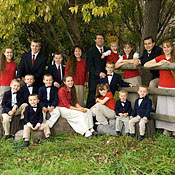 I am also a big Duggar fan, mostly because when I watch the specials they never seem as crazy as you would think a family like that would have to be. Anyone know what the world record for most biological children born to one woman is? These homies put the Sheas to shame. We had some neighbors that had 11 children in 9 years... all with rhyming names ending in yn (Robyn, Hadyn, etc.). What did the parents do for a living? Why run a Christian retreat camp in Texas of course! Who doesn't love the Duggars? I mean, they're crazy, but the show is great. And, there's still one more J name left...JESUS...duh. Sorry, I had to state the obvious. Yeah Meg, your parents had better get on that and start poppin' out some more kids. Or maybe you and Andrew could be the next Duggars! I wonder if that shoe that Meg just threw at Lulu will make it all the way across the country?! ?